Within 250 miles of Fargo, ND. Staring at a black line for a couple of hours every night can become monotonous. At this high performance swim clinic, not only will Olympian Kierra Smith go over technique for a faster butterfly and breaststroke, but she will also teach participants how to maintain motivation and enthusiasm through every day of training! Olympian Kierra Smith will teach your swimmer the KEY components to enhance your overall race performance in specific areas of both butterfly and breaststroke as well as staying motivated through every season of training! BUTTERFLY: Butterfly does NOT have to be the hardest stroke. As an Olympian, Kierra knows the key components to swimming an efficient butterfly stroke. Kierra will teach her favorite drills and exercises to help each participant find an efficient butterfly pull, powerful kicks, and a well timed breath. She has perfected her form to become one of the fastest in the world and she will ensure that your swimmer will leave with more knowledge and confidence in their butterfly stroke! BREASTSTROKE: Breaststroke is the most challenging stroke to master technically. 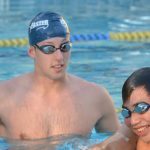 The strategies for proper form in breaststroke require an efficient pull, a powerful kick, proper timing, and an aggressive attack forward each stroke. 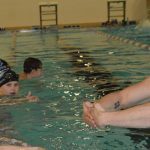 Kierra will help each participant understand what perfect form feels like and she will also teach drills and exercises to practice these skills so that your swimmer can continue to improve now and in the future. MAINTAINING MOTIVATION: Swimming back and forth while staring at a black line can become monotonous to even the best of us! Learn to love the black line! Kierra will talk to swimmers about how to overcome that boredom that inevitably arrises from going to practice every day. Learn to set challenges for yourself, maintain a positive attitude, and not only become a happier swimmer, but a faster one too! Race one of the best swimmers in the world and watch her near-flawless technique - achieved by practicing the same drills she will teach you. Take a photo while wearing clinician's medals, get autographs, and receive a special gift from our sponsors!